Small business owners have to wear many hats making you very busy. Even if you have a financial or accounting background, getting and keeping the books dialed in is hard work. Consider these two thoughts: “The devil is in the details” and “Consistency is the hobgoblin of little minds”. So when you have so much to do, and keeping the big picture in mind is really important, keep track of things with checklists. Keep small stuff in the checklists so you can focus on the horizon. And when you free yourself and your staff from stressing over the small stuff, you are free to focus on creativity. • Checklists can improve everything. Anyone who has critical and complicated tasks should use them. 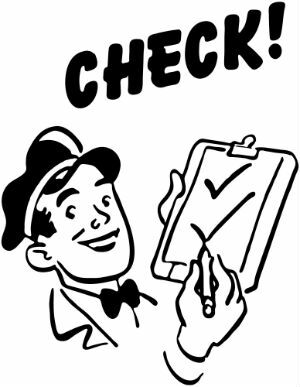 Does your bookkeeper use checklists? What daily, weekly, monthly, quarterly and annual activities are critical? Does it matter if these things are done consistently and more efficiently? You bet it does. That’s why you need checklists. Checklists will help you remember what bookkeeping tasks need to happen, and monitor what does get done; they will also help you find ways to improve efficiency. When you learn how to use checklists for bookkeeping, then you’ll learn to use them in other areas of your business. Checklists can improve the way your whole organization starts up, runs and completes old and new tasks, projects, processes and training. Working with checklists helps you create clarity. Without clarity, endeavors are mere setups for failure. If you want to improve training, productivity, and accuracy while increasing customer, management and staff satisfaction, try some basic project management checklists. Below are some guidelines to use in all areas of human endeavor, including accounting. 1. Used consistently, checklists establish standards for ongoing and new projects. 2. Checklists can ensure clear communications between clients, management and staff. 3. Checklists create accountability by identifying areas that need improvement, which is the first step in any Continuous Improvement Process. • Warning! Effective checklists are interactive. Communication should flow between participants, so have participants initial/sign lists. Even better – provide worksheets or surveys in to increase awareness, report progress and raise issues. Always collect questions & comments – this is key to future improvement. Before – don’t hope for success, program it! 3. Caveats – include warnings of what Not to do, when known. 2. Any further fixes or improvements? To prepare for takeoff pilots run down very extensive checklists to be ready as possible. Sloppy bookkeeping will not likely kill anyone, but it can bring down a whole company. Small business owners rarely want to slow down enough to implement quality improvement programs. But you have to stop assuming that everyone is on the same page as you. Understand that clients, management and staff all have so much at stake and want as much success as possible. Keep refining your checklists as your organization evolves. Without quality improvement in place growth can’t really take root. You will just get more mess faster.